Schluter® TREP-E/EK Stair Nosing Profiles are ideal for interior and exterior high foot traffic areas like public buildings and offices. Schluter® TREP-E and TREP-EK stair nosing profiles protect tile edges, improve stair edge visibility, and have slip-resistant treads, all while looking great! 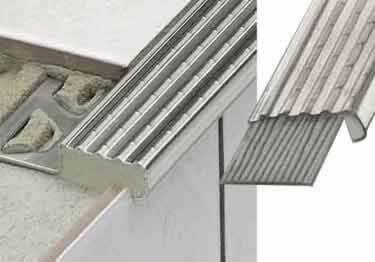 TREP-E has a stainless steel anchoring leg that is embedded into the tile bond coat. TREP-EK has stainless steel construction and can be bonded to existing stair installations. Heights for TREP-E: 3/32", 3/16", 5/16", 7/16", 5/8", 1"
TREP-E heights: 3/32", 3/16", 5/16", 7/16", 5/8", 1"